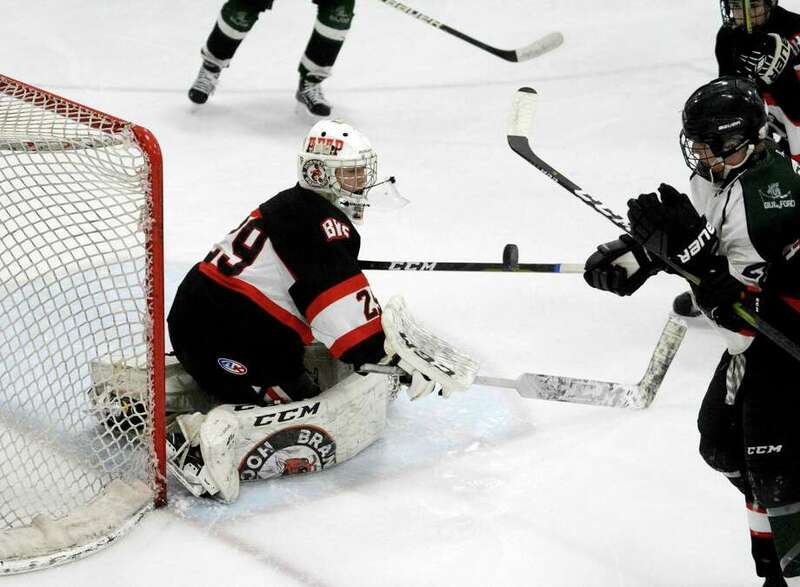 Goalie Jared Yakimoff and Branford will take on Glastonbury in the Division II championship game at Ingalls Rink on Monday. Branford: third appearance, 1-1 overall and Div. II: 1988 def. Shepaug 5-3; 2012 lost to Trumbull 5-3. Glastonbury: fifth appearance, 2-2 overall, 2-0 Div. II: 1999 def. Cheshire 4-3 (OT) (Div. II); 2003 def. Shepaug 6-2 (Div. II); 2009 lost to Hamden 4-1 (Div. I); 2012 lost to Notre Dame-West Haven 5-0 (Div. I). Branford is unbeaten in the past 11 games (10 regulation wins, plus a shootout win after coming back from 4-1 down to force a 4-4 tie with Guilford in the SCC/SWC semifinals). The Hornets have only one loss in the past 17 games. Big goals have come from all over the lineup, and sophomore Jared Yakimoff has been solid in net. Glastonbury, meanwhile, has knocked off both the No. 2 seed, Guilford, and the defending champion, Farmington Valley, to get here. Justin Hazard deftly won a faceoff to himself in the right circle and scored at 22:49 of overtime on Tuesday, ending the longest semifinal or final in the state since the two-day 1999 Division I final that Notre Dame-Fairfield’s Erik Roos won in the fifth (then eight-minute periods, now 15) overtime. Glastonbury beat Branford on opening night, 4-0, on a Brendan O’Connor shutout and an Adam Poetto hat trick. … The last No. 6 seed to win a CIAC tournament was Notre Dame-West Haven, 1993 Division I champion, beating top-seeded Trinity Catholic. … No. 4 seeds have fared a little better, with Guilford the most-recent champion from that spot in 2017.